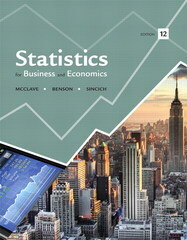 Statistics for Business and Economics 12 Edition Statistics for Business and Economics, Twelfth Edition, meets today's business students with a balance of clarity and rigor, and applications incorporated from a diverse range of industries. This classic text covers a wide variety of data collection and analysis techniques with these goals in mind: developing statistical thinking, learning to assess the credibility and value of inferences made from data, and making informed business decisions. The Twelfth Edition has been updated with real, current data in many of the exercises, examples, and applications. Exercises draw on actual business situations and recent economic events so that students can test their knowledge throughout the course. Statistics in Action case studies open each chapter with a recent, controversial, or high-profile business issue, motivating students to critically evaluate the findings and think through the statistical issues involved. A continued emphasis on ethics highlights the importance of ethical behavior in collecting, interpreting, and reporting on data.